Found 4 file extension associations related to FLV Editor and 1 file format developed specifically for use with FLV Editor. Moyea FLV Editor is the useful FLV editor which enables you to edit FLV files through merging, splitting, cutting, and trimming, and converting FLV to lossless FLV files. You can import MP3 and FLV files encoded with H.264, H.263, Flash 8, Flash 8 with alpha, Sorenson Spark, Nellymoser, etc. and export FLV, SWF, and HTML without any loss of quality. 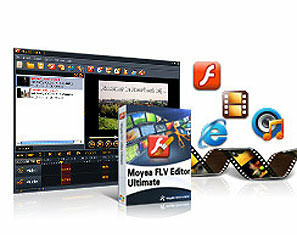 If you need more information please contact the developers of FLV Editor (Moyea Flash Video Software), or check out their product website.